09/29, Tuesday 4:00pm, Soccer game vs Nations at BIS (ages 8 and under). 09/29, Tuesday 5:00pm, Soccer game vs Nations at BIS (ages 10 and under). 10/07, Wednesday 5:15pm, Soccer game vs Nations at EDN (ages 10 and under). 10/08, Thursday 4:30pm, Basketball (league) game vs EAB at EAB (ages 14 and under). 10/08, Thursday 6:00pm, Basketball (league) game vs EAB at EAB (ages 17 and under). 10/15, Thursday 4:30pm, Basketball (league) game vs Nations at EDN (ages 14 and under). 10/15, Thursday 6:00pm, Basketball (league) game vs Nations at EDN (ages 17 and under). Tuesday September 29th at BIS. Who: Boys and Girls (ages 6 to 10). We will have two separate games. 4:00pm game #1 (for students ages 8 and under). 5:00pm game #2 (for students ages 9 and 10). Bring your water bottle and a snack. Plan to stay after school for this game. Instead of soccer club we will play the games. Plan your transportation ahead of time. See details above to be picked up on time at the end of the game. Sign the permission slip to participate (see next page). All family and friends are welcome to come cheer for the Eagles! 09/24, Thursday 4:30pm, Basketball game vs EAB at EAB for girls (Grades 6-8). 09/24, Thursday 5:30pm, Basketball game vs EAB at EAB for boys (Grades 6-8). Thursday September 24th at EAB. Who: Boys and Girls (Grades 6-8.). We will have two separate games. Where: EAB (605 Asa Sul). Plan to go straight from school to this game. Schedule for Saturday 09/19/15 Basketball Tournament. Great game today. The Eagles lost by one point. On Saturday (9/19) we'll play at 9:00am and then at 1:30pm at School of Naions. After we'll play either at 4:30pm or 6:00pm depending on the results of the other games. Players should bring money for lunch, snacks, and maybe some school work to do between games. It's going to be a long day with lots of basketball! 6.30pm game cancelled for Friday. We'll play only at 4:00pm. I just got a message that one of the teams dropped out of the tournament (Santa Terezinha). So they've changed the schedule and now we'll only play one game today at 4:00pm. So we should be finished at 6:30pm. Please communicate this to your parents and drivers to have transportation ready to pick you up tonight at 6:30pm at School of Nations. Also the schedule for Saturday will probably be different also and we'll get an update latter today once we are at School of Nations. 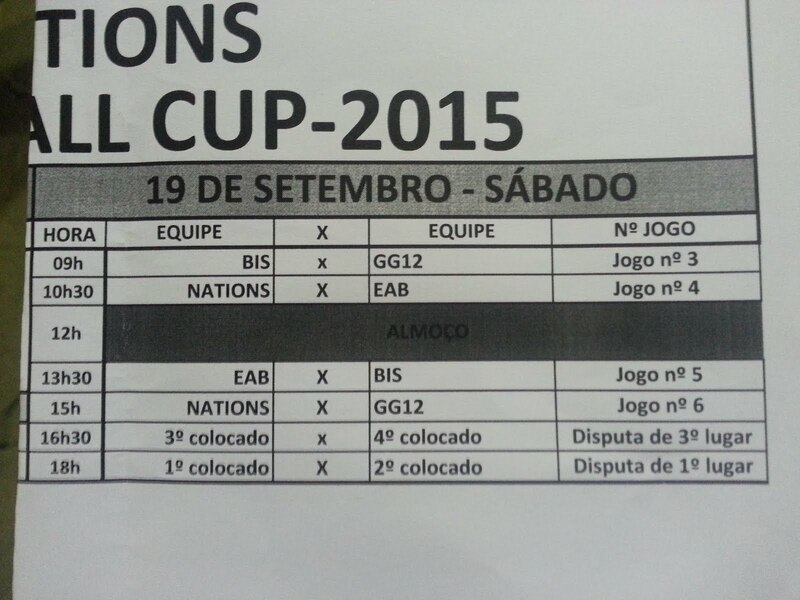 Schedule for Nations Cup Basketball Tournament. See the schedule below for the specific times for each game. Friday and Saturday, September 18th and 19th at EDN. Who: HS boys (9th to 12th graders). Where: EDN (Escola das Nações, Lago Sul). When: Friday and Saturday, September 17th and 18th. 09/17, Thursday, 4:00pm to 9:00pm. Basketball camp for 6th to 12th grade at BIS (there will be no school on Friday 09/18). 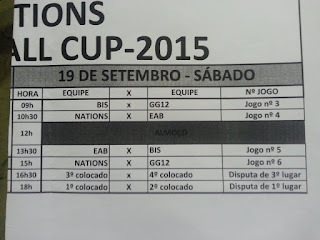 09/18 Friday and 09/19 Saturday, Nations Cup Basketball Tournament for HS boys (9th to 12th graders). Located at School of Nations in Lago Sul. 09/24, Thursday 4:30pm, Basketball game vs EAB at EAB for boys (ages 12 to14). 10/03, Saturday, 9:00am to 5:00pm. Basketball tournament at BIS. Thursday September 17th at BIS. Who: All secondary/middle school students (Grades 6-12). 3:30pm to 6:00pm practice basketball. 6:00pm to 7:30pm, rest, eat dinner (pizza), and watch basketball videos. 7:30pm to 8:50pm, practice basketball and watch basketball videos. Bring R$20 to pay for your pizza. Plan your transportation ahead of time. See details above to be picked up on time at the end of practice. We will post the exact times of the games once the tournament coordinator releases the official draw. The games should be on Friday afternoon and Saturday throughout the day.